A quick meatless option for busy nights! Slice the vegetables lengthwise to ¼-inch thickness. Place on a baking pan and brush with olive oil. Season with salt and pepper to taste. Roast for 20 minutes. In a small bowl, combine the avocado, yogurt, jalapeño, garlic and ½ teaspoon salt. Spread each side of the roll with desired amount of mashed avocado mixture. 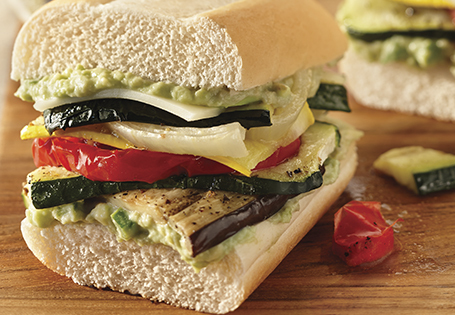 Divide the vegetables between the sandwiches and top with cheese. Bake for 5 minutes. TIP: Use a whole wheat roll or bread to increase the fiber and nutrients.